Where to seek treatment for baby (pediatric) eczema in Singapore? Atopic dermatitis or eczema affects up to 20% of school-going children. We have compiled a list of pediatric dermatologists (skin specialists) in Singapore that offer consultation and treatment for eczema in babies and children. In no particular order, here is the list. (Coconuts Media) - A 2000s-era Thai pop star is back in the spotlight after this weekend speaking publicly about her “near death story” following a breast augmentation surgery in South Korea that went terribly wrong. Jeeranan said that, in an attempt to improve her posture (*ahem*) and confidence, she paid a whopping THB800,000 (US$24,000) to have the surgery at Grand Plastic Surgery hospital in Seoul, which she said had many positive reviews. But soon after the operation, Jeeranan said her breasts had caused irregular bleeding and burning sensations, something she claims her doctor and nurses said was perfectly normal. (SCMP) - Two South Koreans and a Hong Kong woman who recommended liposuction to an undercover police officer during a consultation at a five-star hotel two years ago walked free from court on Monday. South Korean company manager Ryu Seung-yeon, 28; doctor Seo Jae-won, 37; and Cheung Lok-yan, 33, director of the Hong Kong intermediary “365MC”; were found not guilty of one joint count of practising medicine without a registration. The two South Koreans were subsequently cleared of breaching their conditions of stay, while Cheung was also found not guilty of aiding and abetting them. The Eastern Court case hinged on whether a consultation on improving body figure and weight loss amounted to practising Western medicine under Hong Kong law. Senior public prosecutor Jasmine Ching Wai-ming had summoned two doctors to support her case that the trio practised medicine on policewoman Yam Ka-bo during a sting operation at the Conrad Hong Kong hotel on November 20, 2016. (New Straits Times) - The Health Ministry's National Pharmaceutical Regulatory Department (NPRA) has named seven cosmetics products that contain scheduled poison which can be harmful to health. The products are Qu Gebu AP Krim, Night Glowing, Night Glow, Glowing Speed Gold Day Cream, Glowing Speed Gold Night Cream, Nour Ain Night Cream and Royal Expert Whitening Cream. 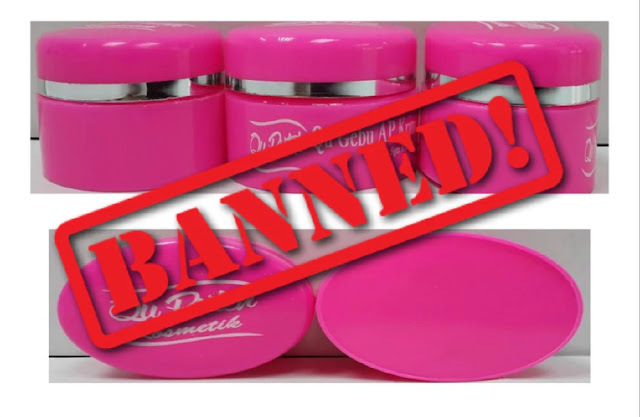 Health Director-General Datuk Dr Noor Hisham Abdullah, in a statement said the notifications of these cosmetics products have been cancelled after detecting scheduled poison materials in the products. Dr Noor Hisham said among the scheduled poison found in the products were hydroquinone, tretinoin and mercury, which are prohibited in the cosmetic products. Qu Gebu AP Krim and Night Glow have been found to contain hydroquinone and tretinoin, while Night Glowing, Glowing Speed Gold Day Cream, Glowing Speed Gold Night Cream, Nour Ain Night Cream and Royal Expert Whitening Cream contained mercury.